The young Walt Disney’s struggles to start his career in animation seems like promising fodder for a bio pic. Seeing the young man fail and fail again at something his father disapproved of, fight his personal demons, meet and team up with animators Ub Iwerks, Friz Freleng, and those Harmon and Ising chaps, that sounds like a movie, maybe even one those “dreamers” at Disney might tackle. Perhaps all the chain smoking keeps The Mouse from making it. 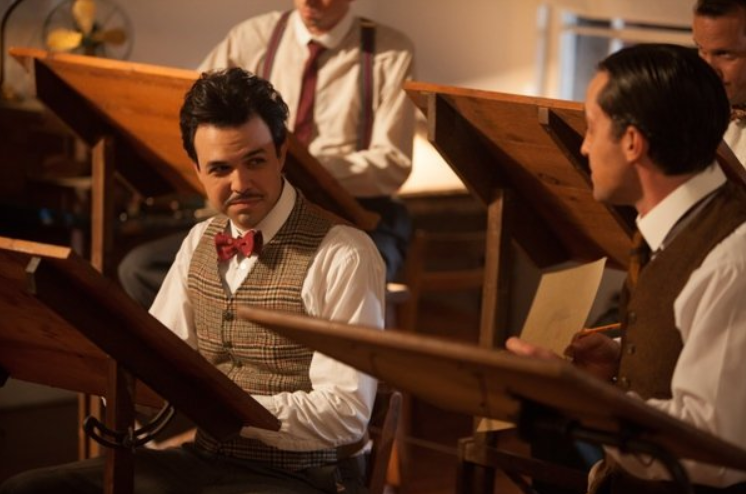 “Walt Before Mickey” is a seriously malnourished, talent and charisma-starved look at those years, when a small town boy tried to make a go of it, first in Kansas City, then in Hollywood itself. The cast has hints of competence, if not a lot of experience smoking or wearing (each man’s first) mustaches. But the script offers no places for them to shine. It was a troubled production — director replaced a week into shooting, etc. The replacement director (Khoa Le) doesn’t seem to give anyone, ANYONE, a second take that allows them to do anything. Time constraints? Not enough to excuse the bloodless/lifeless performances. 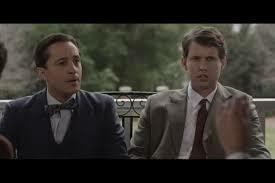 And the whole period piece, shot in and around Deland, Florida, looks like it was lit by a wedding photographer. If ever a movie screamed out for sepia toned treatment (hiding some of the lack of production polish), this was it. See Walt (Thomas Ian Nicholas, recently seen in “Red Band Society”) start and lose his first company, and fall so low in his spirits and finances that he takes on a pet mouse. Which he can’t afford to feed. Disney dumpster diving isn’t exactly in the company biography of the man. See his sickly WWI vet brother Roy (Jon “Napoleon Dynamite” Heder) take on running the nascent fresh start Disney Studios’ finances. See their struggles to make those “Alice in Movie Land” semi-animated shorts with almost no money, an assortment of less- than-talented live action girl stars playing “Alice,” and little precedent for everything they were trying in this still-new medium. Meet the team — Iwerks (Armando Gutierrez, who barely registers — Did they mike him? ), Freleng (Taylor Gray), Hugh and Fred Harman, Rudy Ising, names attached to many an animated short over the ensuing decades. Meet Lillian (Kate Katzman), the secretary/inker Walt hires and falls in love with. Watch Walt get screwed over by the Mintzes, his distributors, which savvy viewers will see as the moment his anti-Semitism hardened into something the “official” biographies don’t like to acknowledge. There’s also a smidge of his future anti-union/anti-taxes ethos. And keep an eye peeled for the “Eureka” moment, when Walt finds the character and business approach — total control — that would make Disney famous. It’s a tough subject to, um, animate — just guys, sitting at drawing boards, making magic. There’s a reason Disney World’s Animation tour closed, and not all of them have to do with shipping those jobs to Asia. The film begs for more and livelier scenes of the DIY nature of the work, sketches becoming moving characters, characters turning into moving pictures. A few snippets of pre-history Disney films liven up the film, many more were needed. Copyright issues? The dialogue is dull, boilerplate corn, the performances are flat, the cinematography is flatter. Walt would have never become DISNEY if he and his wish upon a star had been this modest. Credits: Directed by Khoa Le, script by Arthur Bernstein and Armando Gutierrez. A Voltage release.